This post is in no way sponsored by Coursera - I simply just want to share a great, and free, opportunity with others. All opinions expressed are my own. I finished my undergrad over 5 years ago. But, just because those days are over, doesn't mean that I don't enjoy learning anymore. So call me a nerd, but this month I started a FREE, ONLINE course from Coursera. Call it "professional development" if you will. Haven't heard of Coursera? Well, I recommend you check it out. Coursera's philosophy is simple and one that's hard not to agree with - they believe in connecting people to a great education so that anyone around the world can learn without limits and aim to empower people with education that will improve their lives, the lives of their families and the communities they live in. Whether you're looking to improve your resume, advance your career, expand your knowledge and personal interests or just "kill some time", there is a course, or two, for you on Coursera. Signup is simple and there are a range of topics to chose from - from biology and life sciences, to communications, humanities, history and finances - all offered to you by accredited institutions such as Duke, Princeton and Brown, just to name a few. Courses range in length from a few weeks, to a few months, and have different start dates. If there is a course that interests you, but isn't available at the moment, you can be added to the "watch list" and will receive notifications when start dates are announced. And if it doesn't sound amazing enough already, upon completion of Coursera courses, you will even receive a certificate! For a small fee of $50 (hey, compared to a regular university course that's pretty small), this certificate can be verified by the institution leading the course, making it legit. By signing up for a free, online course from Coursera, not only am I completing a course in my field, and in something that greatly interests me, I am connecting with others across the globe that share similar passions with me. After all, you're never too old to learn. Do you believe in continued education? Have you ever heard of Coursera? WHAT!?! This is amazing, I am so glad you posted this!! 1. because I am missing school and learning and 2. because one of my goals for the year was to complete an free online course in something that interests me :) I am definitely checking this out! This is FANTASTIC, I'm going to check it out right now! Thanks for sharing!!! That's pretty sweet! Checking it out now! Thanks so much for putting this up! 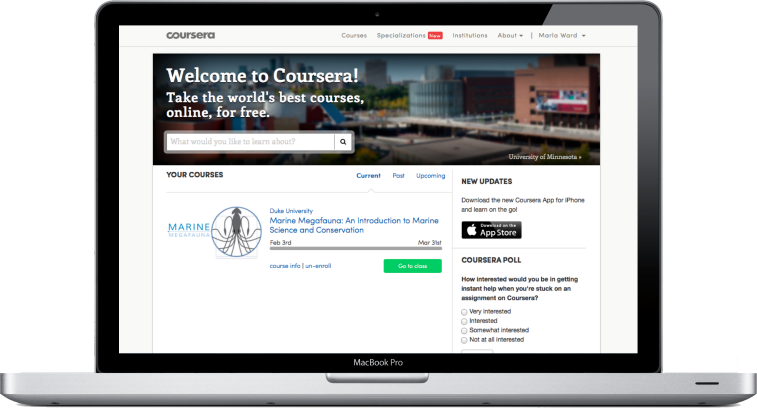 I've never heard of Coursera, but will definitely be checking it out. I'm currently taking my MBA, but always looking for something new! That's awesome! I love learning and I'm totally gonna check that out!